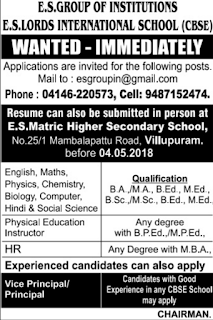 E.S Lords International School, Villupuram has advertised in THE DINAMALAR newspaper for recruitment of TGT jobs vacancies. Interested and eligible job aspirants are requested to Apply before 4th May 2018.Check out further more details below. About School:The school is located on National Highway (NH) 45 in Villupuram. Villupuram is the headquarters of Villupuram district and is 160 kms from the Tamil Nadu state capital of Chennai. Villupuram is just 40 kms from Puducherry,the capital of UT of Puducherry. Experienced candidates can also apply. How to Apply: Application are invited from qualified candidates before 4th May 2018. Resume also submitted in person to E.S Matric Hr.Sec.School. 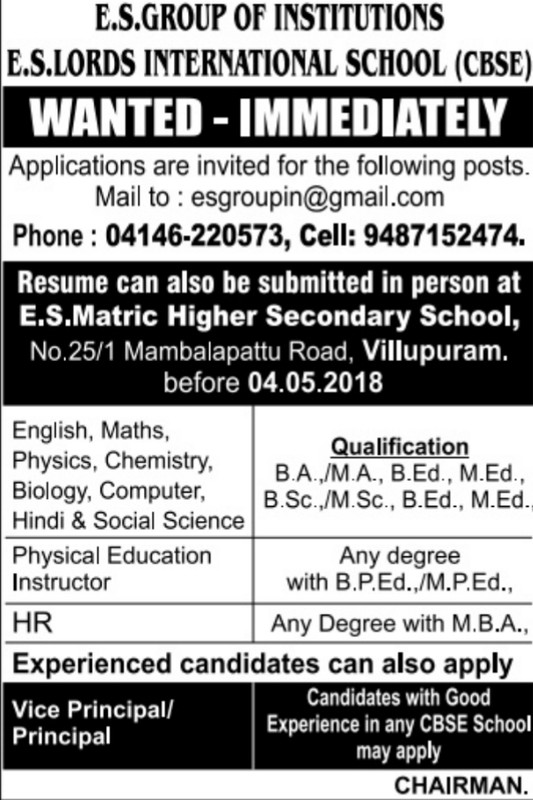 Reference: Advertisement on THE DINAMALAR Newspaper dated on 1st May 2018.